In the days of Ancient Israel, before the time of Christ, it was considered to be a blessing from God if you had a large family and even in Jesus day, if a couple was childless, the Jews considered them as being under some sort of curse due to some sin in the family. The Jews believed that God commanded them to be fruitful and multiply so this was expected of every Jewish family and if there were no children in the family then God had, in their minds, obviously placed that family under some sort of curse because of their sin so with this background in the cultural belief system of the Jews we begin the story of Naomi taken from the Book of Ruth. There was a time of severe drought in Judah and “Elimelech, the husband of Naomi, died, and she was left with her two sons” (Ruth 1:3) and after her sons took Moabite wives (Ruth 1:4) both died “so that the woman (Naomi) was left without her two sons and her husband” (Ruth 1:5). Can you picture how much shame she felt and the Jews must have judged her by these tragedies. All she could do was tell her two daughter-in-laws to go back to Moab to their families (Ruth 1:8) and so “Orpah kissed her mother-in-law, but Ruth clung to” Naomi (Ruth 1:14) as Orpah returned but Ruth said “Do not urge me to leave you or to return from following you. For where you go I will go, and where you lodge I will lodge. Your people shall be my people, and your God my God. Where you die I will die, and there will I be buried. May the Lord do so to me and more also if anything but death parts me from you.” And when Naomi saw that she was determined to go with her, she said no more” (Ruth 1:16-18). Ruth came back with sacks full of grain after “Boaz instructed his young men, saying, “Let her glean even among the sheaves, and do not reproach her. And also pull out some from the bundles for her and leave it for her to glean, and do not rebuke her” (Ruth 2:15-16) “And Naomi said to her daughter-in-law, “May he be blessed by the Lord, whose kindness has not forsaken the living or the dead!” Naomi also said to her, “The man is a close relative of ours, one of our redeemers” (Ruth 2:20). God had been watching over Ruth too as well as Naomi as Boaz commanded the men “Have I not charged the young men not to touch you” (Ruth 2:9) with the clear meaning of this “keep your hands off of her, do not molest her in any way” and so by following Naomi’s suggestions, Ruth had been placed under the sovereign care and protection of God through Boaz’ hand. Naomi once more suggests something for Ruth’s benefit saying “Is not Boaz our relative, with whose young women you were? See, he is winnowing barley tonight at the threshing floor. Wash therefore and anoint yourself, and put on your cloak and go down to the threshing floor, but do not make yourself known to the man until he has finished eating and drinking. But when he lies down, observe the place where he lies. Then go and uncover his feet and lie down, and he will tell you what to do.” And she replied, “All that you say I will do” (Ruth 3:2-5). Then “Boaz took Ruth, and she became his wife. And he went in to her, and the Lord gave her conception, and she bore a son. Then the women said to Naomi, “Blessed be the Lord, who has not left you this day without a redeemer, and may his name be renowned in Israel! He shall be to you a restorer of life and a nourisher of your old age, for your daughter-in-law who loves you, who is more to you than seven sons, has given birth to him.” Then Naomi took the child and laid him on her lap and became his nurse. And the women of the neighborhood gave him a name, saying, “A son has been born to Naomi.” They named him Obed. 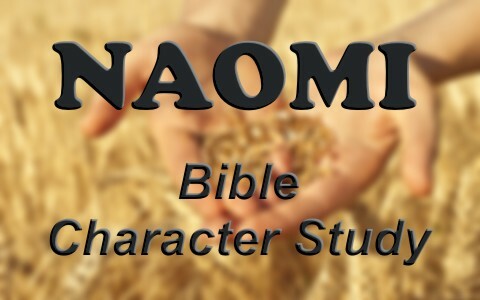 He was the father of Jesse, the father of David” (Ruth 4:13-17) so after Boaz redeemed Ruth by being her kinsman redeemer and marrying her, Naomi could once again live up to her name of “pleasant” and be “Mara” or bitter no more. At Naomi’s suggestions to Ruth, she saved herself from being childless as well as it was said of Naomi, “A son has been born to Naomi” and this son would be in the lineage of King David but even greater, the child would be in the family line of the coming Messiah, Jesus Christ, Who is the Great Redeemer of all who place their trust in Him. Amen. Thank you for a clear articulation of the story! Next post: What Does The Word “Maranatha” Mean In The Bible?